Monday Head Scratcher — Apologies! We knew this was a bad idea when Dennis Cheeseman stumped us with this photo montage of Green-winged Teals last week. He wanted to know what was different about one of the teals, and after we gave up, he said that one of the teal's eyes were closed. So we follishly posted it. Our apologies. We blame Dennis. Clearly, we've been looking at too many teals for too long. We do plan to post a genuine photo of a "possible Eurasian Green-winged Teal" tomorrow, along with a Tuesday Teaser involving the ageless Merlin vs. young Peregrine Falcon debate. DeKorte Park will be open on Thanksgiving (Thursday, Nov. 24), but the Meadowlands Environment Center (and its restrooms) will be closed. 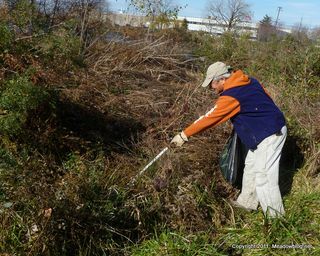 Some 20 folks participated in a Skeetkill Creek Marsh cleanup, sponsored by the Meadowlands Conservation Trust, which owns and maintains this lovely 16.3-acre marsh in Ridgefield. 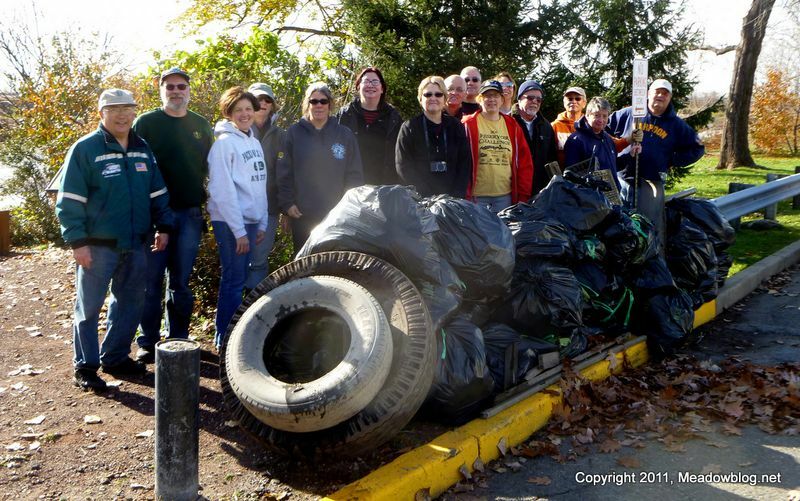 In addition to roughly 30 garbage bags of trash, the volunteers removed a few tires, a plastic milk crate or two, a discarded (propane?) cannister, and a 10-foot pole, with which we wouldn't touch some of that trash if we weren't wearing gloves. The Ridgefield Environmental Commission was a huge help as well. Great job by all! The Meadowlands Conservation Trust passes along its gratitude. More on the MCT here. 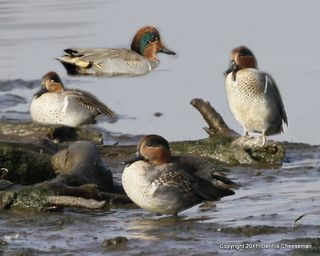 Dennis Cheeseman asks: What is different about one of the Green-winged Teal in this Photo-shopped photo? All I'm saying is that it was not my idea.